Many sports teams have their own, special traditions that distinguish them from other teams and give them a sense of identity and community. One such custom, practiced by the Fountain Valley High School cross country team, has been inspiring athletes at FVHS for over two decades: the legacy tradition. “The legacy book tradition allows a senior to write and gift a narrative account of their experience in cross country to a freshman or sophomore who they choose to continue their legacy… the senior will typically offer words of encouragement and advice in this manuscript, which can range from a single page to the length of a short book and is typically handed from the senior to the lowerclassmen in a ceremony during the post-season banquet,” said Boys’ Cross Country Assistant Coach Luis Morales. 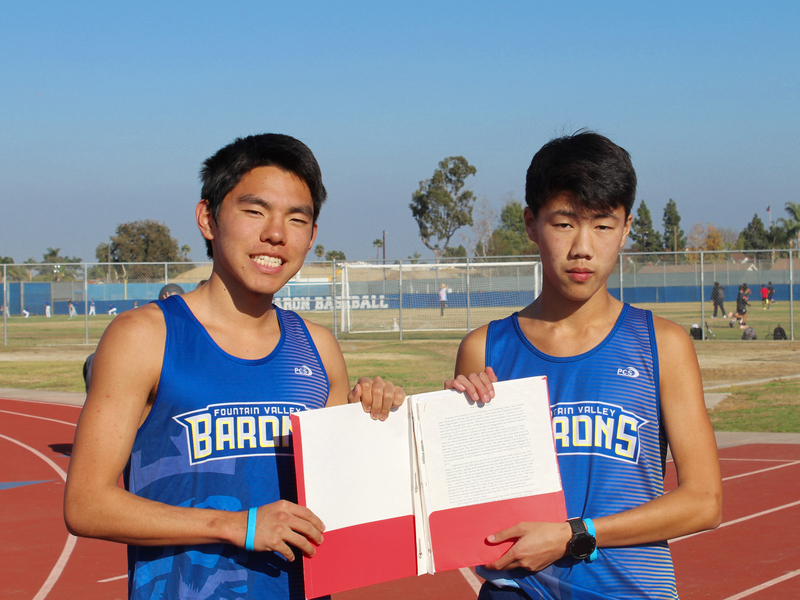 Morales, himself an alumnus of the FVHS cross country program, received a legacy book as a freshman from Eric Dyson, the top varsity runner of the class of 2008. Morales passed on that book in the fall of 2010, and it has since passed through three other athletes before reaching its current holder, a sophomore, in the fall of 2017. This chain of inheritance, which is reflective of many of the currently living legacy books, is one of the most critical aspects of the tradition. Not all legacy books, however, have such long histories. Seniors who do not receive legacies as freshmen or sophomores can start their own. This was the case this year for senior Nicholas Mockus, boys’ team captain and one of two male legacy givers of the class of 2019. Whether they pass on an old legacy book or start a new one, giving a book is a powerful opportunity for graduating seniors to leave a lasting contribution to the culture of their team by choosing an underclassman that they see themselves in, and offering some of their hard-earned wisdom and experience to shape the recipient into a better runner and leader. For this reason, it is considered a high honor both to give and receive a legacy book. “When Nick gave me his legacy I was surprised, first because I didn’t think I would receive one and second [because] there were many other people he could have chosen from, yet it was me. That will be my most memorable moment of this year; it made me feel like I do stand out in our team,” said sophomore Dezi Hernandez, who received Mockus’ legacy this year. However, the legacy tradition is not only an exciting custom for the individual givers and recipients — it’s also an opportunity for seniors to reflect on their last four years and offer some insight to the entire team. During the ceremony at the banquet where legacy books are given, seniors from both the boys’ and girls’ teams give speeches recounting their experience to all in attendance. Goeller, who started her own legacy book, is an exception in the legacy tradition for two reasons. Not only did she pass her legacy to a junior rather than a freshman or sophomore, she chose two recipients for her legacy — twin sisters Ellie and Grace Peterson. This sense of interclass connection, which is crucial in all sports teams, is especially important in cross country, a sport infamous for its embrace of pain and extreme mental and physical demand. One of the chief factors in retaining members in a sport where athletes run anywhere from 30 to 60 miles a week is a robust team culture, which the legacy tradition works to build. The FVHS cross country team’s legacy book tradition builds several of the universal athletic virtues — community, communication, and motivation. In doing so, it also gives athletes a chance to contribute to something greater than themselves, and leave behind a story that can last for generations. This is a super cool tradition! Super crazy it’s been going on for such a long time too. I can only imagine how many tips have been passed down over the years. Anyway, I just wanted to say that I enjoyed reading your article!